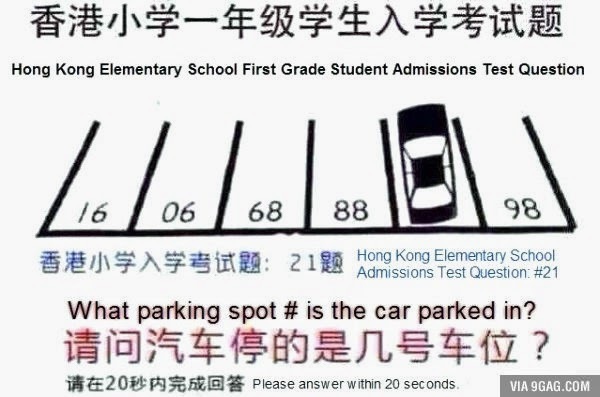 Can you solve this in 20 seconds? If not, perhaps you are like I not ready for the 1st grade. The answers are accepted any time until midnight Eastern Time on Sunday, on our Family Puzzle Marathon. 87. Numbers are facing away from the viewer. Wonderful! The answer is 87. It took me a bit to come up with an answer: much more than 20 seconds, like about 15 times more. I think you are reading the numbers as though you were in front, not behind the parking spots. So the answer should be 87, shouldn't it? Nice puzzle; took me a minute. so, the covered space is # 87! The car is parked in spot 87. The image is backwards from our perspective. 87. View from the other side. Nice problem...!!! 87 - seen immediately and not on my smartphone! 87- The numbers are upside down. 87 although it took me making the picture larger to understand. in blog preview mode it was too small. 87, have to view the image upside down. At first I looked at the puzzle, and I saw no way I could come up with the missing number where the car was parked. I wrote down the numbers trying to see a pattern. I remembered that you (MathMom) said these were first graders that solved the problem and I knew there must be something easier than patterns for first graders. I just couldn't come up with an answer. I copied the puzzle problem and today I pulled it out of my math bag upside down. I immediately saw what the first graders saw...the answer is 87. I'm not sure how but I saw it was 87 after a few moments. The numbers are printed right side up on the page, as you can see that the loops on some of the 8s closest to the viewer are slightly larger. However, if you consider the puzzle to be printed in perspective I suppose you would see what's closer as larger regardless of the font, so it makes sense. I showed this puzzle to my 9-year-old a couple of times but she had no idea. I think I'll use the ipad method with her. As an aside, do you think there is much value in being told the answer to a math puzzle? In other words is it better, from a learning perspective, to be told the answer, or to keep struggling with it even if one loses interest after a time?